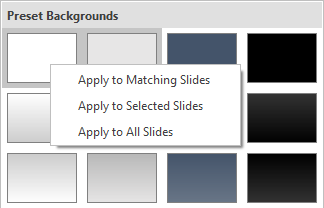 In ActivePresenter 7, when you apply any theme, you see all slides have the same default background style. This background style is one of twelve Preset Background Styles provided with the applied theme. All themes have their own Preset Background Styles. This today’s tutorial is all about how to use and customize these background styles. Step 2: Click Design tab > Background Styles. Then, you see the preset background gallery. In the preset background gallery, one of these 12 styles is highlighted with a gray outline. This indicates the background style applied to the selected slide. You can hover over any style to see how it will affect the look of your slide. In addition, there are two options in this gallery. I’ll talk about them in the note below. 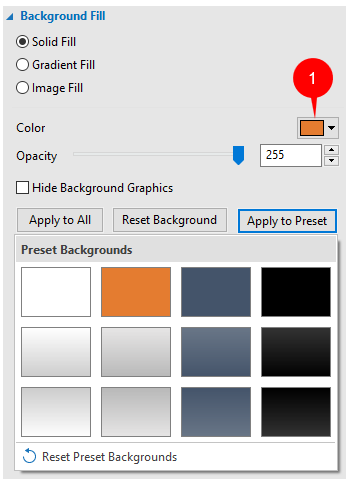 Step 3: To apply a preset background style, click any style you want. This changes the background style of all slides that use the same Slide Master as the selected slide. Apply to Matching Slides: This option works the same way as when you click a preset background style. Apply to Selected Slides: This applied the background style to currently selected slides only. 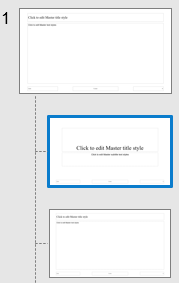 The option is useful when you want to apply different styles to different slides. When you switch to a new theme, Preset Background Styles are updated. Each theme has a different set of Preset Background Styles. The colors of Preset Background Styles are based on the Theme Colors. If the new background style doesn’t satisfy you, click Reset Slide Background to restore the original slide background. The Hide Background Objects check box is available for slide layouts and slides only. When checked, this option hides objects in the Slide Master that is used by the slide. ActivePresenter lets you customize Preset Background Styles. This means you’re able to create your own set of Preset Background Styles. Note that you need to have a basic knowledge of Slide Masters to do this task. Step 1: Select the slide you want to change its Preset Background Style. Step 2: In the View tab > Slide Master . Then, the Master View appears. Looking at the left pane, you see a selected layout used by the current slide. Step 3: Go to the Properties pane > Slide Properties tab > Background Fill section. Solid Fill: Add a solid color background to your slide. To select the color, click the Color Picker (1). Gradient Fill: Specify a gradient as a slide background. A gradient is a mix of two or more colors which merge into each other. Image Fill: Import an image from your file system as a slide background. Another way to do that is use the Background Image section in the Properties pane. For more details about how to use those options, see Modifying Slide Background. Step 4: Click Apply to Preset and select any preset background you wish to change. You can see the new color is applied to it immediately. If the change doesn’t please you, click Reset Background to revert to the original background. Step 5: Navigate to the Slide Master tab > Close Master View . Then, click Design > Background Styles to see the new Preset Background Styles. 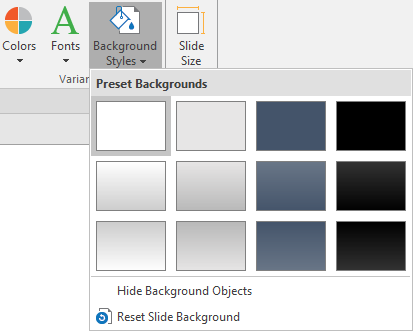 Working with Preset Background Styles in ActivePresenter 7 is as simple as that. So, download the app today and try this feature. Don’t forget to contact us if you need any support.